My face rests in the mud, my head still ringing from the thump it took as I tripped over a tree root and fell. It seemed to take so long to reach the ground, and all through my fall was that distant rumbling – not really a sound, more like a feeling that something is terribly wrong. I open one eye and see a line of forest sloping upwards in all different shades of green and grey, as though it’s hanging from the side of a cliff. Right at the top is a small bright space where I am sure something was there before. As the ringing in my head fades, tiny specks of light drift across the sky…and round, round, the trees now start to spin and hands pull at me as I am lifted up from lying in the mud into comfortable, friendly arms. The second book of the Conorol Trilogy, Almost Gone follows Caeleb, Merod and Eoran, three young people searching for answers in a changing world. As each makes their journey, they start to understand the true nature of the change that is happening to the land, themselves, and to their relationships with each other, and the sacrifices they will have to make to keep any one of these intact. 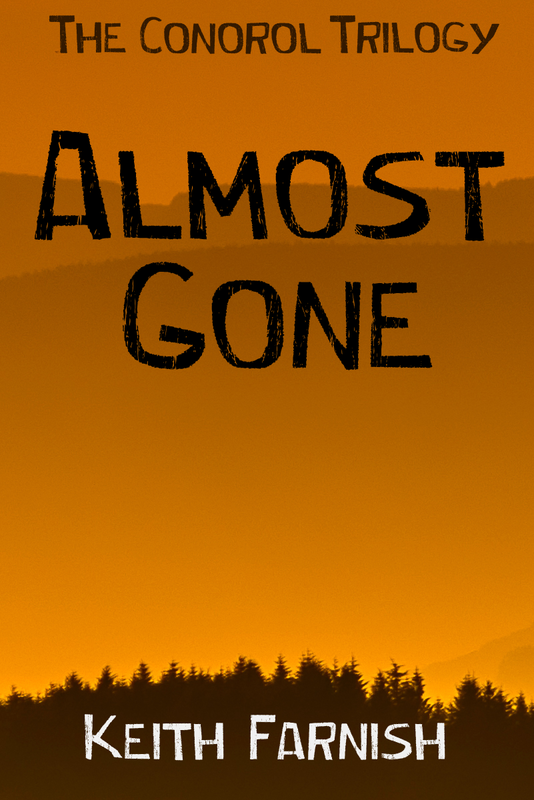 Almost Gone is currently in the process of editing.